There are loads of benefits to being self-employed, not least the fact that there is literally no cap on your earnings and you have the lovely knowledge that you’re your own boss. But there are plenty of pitfalls and problems too, and even the most positive person should be prepared that self-employed is difficult, frustrating and very, very hard work. Check out the following list of the most common issues faced by self-employed people, with tips on how to handle them. Good time management is perhaps the most important skill you need to learn as a self-employed person, but it can be one of the hardest to learn if you’ve only ever worked in a corporate environment. In most non-self-employed roles, there is either a boss or a line manager telling you what to do and when. That’s not just what work to do when, or when your deadlines are, but right down to when you need to arrive for work, when you can take your lunch and when to go home. It’s really difficult to be your own boss and decide when to start and end work – it can easily happen that you work too long or not long enough, both of which can be terrible for your new business. 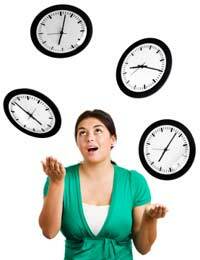 Learning good time management starts with understanding what you need to achieve. Lists are your friends, and so are clear short, medium and long-term targets. Take time to work out what you want to happen with your self-employment – do you have a particular target client, financial result or project date? Work out what you need to do to achieve it and make yourself a timetable that you stick to – you are literally your ‘own boss’ so you need to act like a boss and the employee. When you’ve got a self-imposed deadline but no boss breathing down your neck, the idea of watching a little bit of daytime television, calling your mum or popping to the supermarket can all seem like a terrific idea. Or a friend pops in and you put the kettle on because it would be rude not to, or you start surfing the internet to find your husband the perfect birthday present, or, or, or…the list is endless. When you’re self-employed there are so many interruptions in your everyday life that you simply have to learn to say ‘no’ – both to yourself and others. After all, you wouldn’t go to your sister’s office and sit on her desk and expect her to make you a cup of tea in the middle of the day would you? So why let people think that you’re happy to take a random break? After all, if you say ‘yes, how are they to know? Set yourself clear times when you can put dinner in the slow cooker, or call a friend to say happy birthday, and educate the people around you that you’re taking a lunch break, rather than you’re sort of ‘half working’ all the time. This is especially true when you work from home, which the majority of self-employed people do at least at the beginning, which is exactly the time that you need to be most focused on your new business. There is so much help and support out there for the newly self-employed that there really is no reason to get yourself in a pickle with tax and bookkeeping. Even if you do not want to pay an accountant or bookkeeper until you’re making a bit more money, there are heaps of free resources including your bank, Business Link and all manner of schemes you can find out about online. The first thing to remember is that you have to register with the Inland Revenue within three months of becoming self-employed – this is literally just a phone call (the people at HMRC are usually really informed and friendly) to say you are now self-employed. If you don’t do this, you could get fined, so it’s really worth it, especially as you get sent some helpful paperwork about what receipts etc to keep for your end of year tax returns. When you’re employed in an office and have to sit next to Barry from accounts licking the lid of his yoghurt at 12.52 every day, it can be hard to imagine that you’ll ever miss your colleagues. But self-employment can be lonely – make sure that you keep in touch with your friends, family and professional contacts. This can be easier said than done, especially when you’ve got a new business to set up and it’s all you can think about, but having regular chats, coffees or glasses of wine with people that care about you will make all the difference.